English gardener Charles Jones (1866-1959) worked on several private estates, including Ote Hall in Sussex. 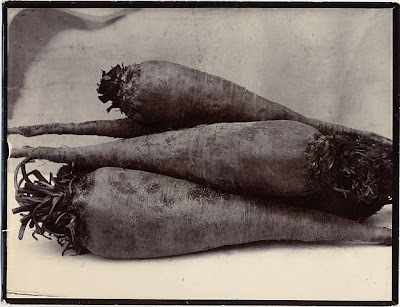 He had a hobby which not even his family knew about: photographing the fruits (and vegetables) of his labors. It wasn't until 1981 at an antique market that his beautiful work came to light: several hundred gelatin silver prints in a trunk, most of them vegetables, a quarter of them fruits and flowers. All had been exposed on glass negatives, each noted the name of the plant and were inscribed with the photographer's name or initials, and few were duplicates. Never shown during his lifetime, they have now been exhibited in London, Chicago, San Francisco, Boston, and Lausanne, Switzerland, and are the subject of a book, Plant Kingdoms: The Photographs of Charles Jones, published in 1998 by Sean Sexton - the man who accidentally found the photos. 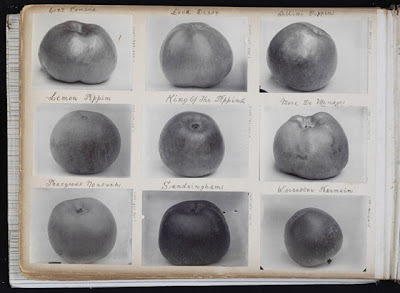 About the image at the top, the Victoria and Albert Museum writes, "His photographs of apples, photographed against a neutral background to capture each specimen's individuality, show his deep understanding of their plain beauty, brought about by tending them daily." The same can be said of his beets (above), beans, plums, onions, and mangel-wurzels. Charles Jones left no notes or diaries, so the photographs have to speak for themselves.